Leahy drops a tsunami of sobering facts and infographics on the heads of readers who take what comes out of their faucets for granted. Focusing not on fresh water use in general but on its “footprint”—meaning water that agricultural and manufacturing processes leave polluted or otherwise locally unusable—the author sprays his urgently toned narrative with alarming observations and eye-opening comparisons. These are all pumped from cited official reports and studies, and they range from (extensive) lists of contaminants found in the drinking water of various municipalities to evidence that biofuel production is not a sustainable process and an ominous claim that the water in the Midwest’s Ogallala Aquifer is being drained 14 times faster that it is being replaced. The wellspring of his argument is presented in dozens of image-based color maps and charts. There’s a picture of a cloth diaper next to the 18-liter water bottle that represents its manufacturing footprint and a disposable paired to 31; another image presents 15 filled bathtubs to show how much water a meat-based diet consumes each day. 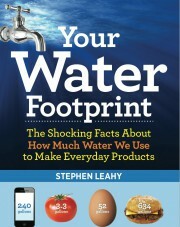 Though quoting an estimate that household use accounts for only 14 percent of humanity’s water footprint, he closes with a chapter of general water-saving tips that will at least make readers feel better as they face the apparently inevitable dry times ahead. This entry was posted in climate change, energy, environment, food, global warming, pollution, Water and tagged beef, clothes, cotton, drought, electricity, Energy, Flood, food, hidden water, meat, virtual water, water footprint, water scarcity, water shortage by Stephen. Bookmark the permalink.